John Blaymire, 1733. West elevation. 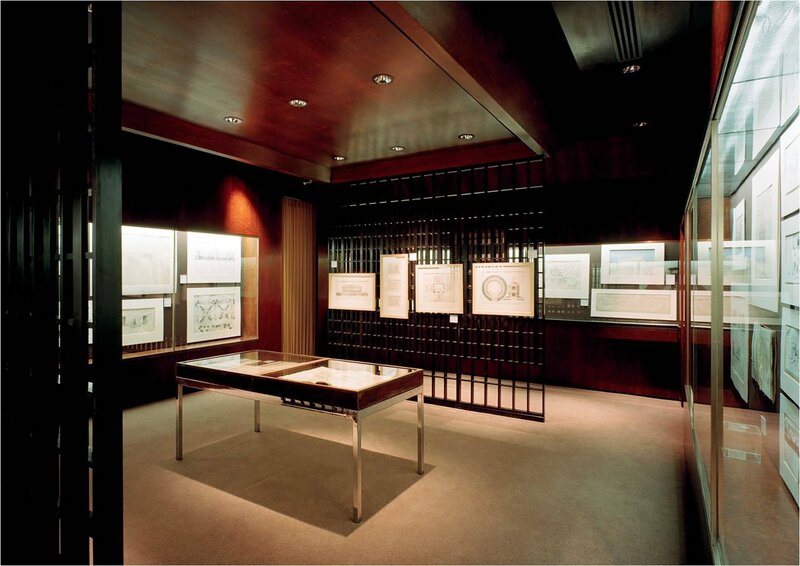 Collection: Representative Church Body Library and Archives. St Patrick’s Cathedral, Dublin, is the larger of Dublin’s two Church of Ireland cathedrals. With origins as far back as the ninth century and building elements dating from the thirteenth century onwards, it has a complex history, not the least part of which is the evolution of its architectural form. This exhibition documents some of that story. 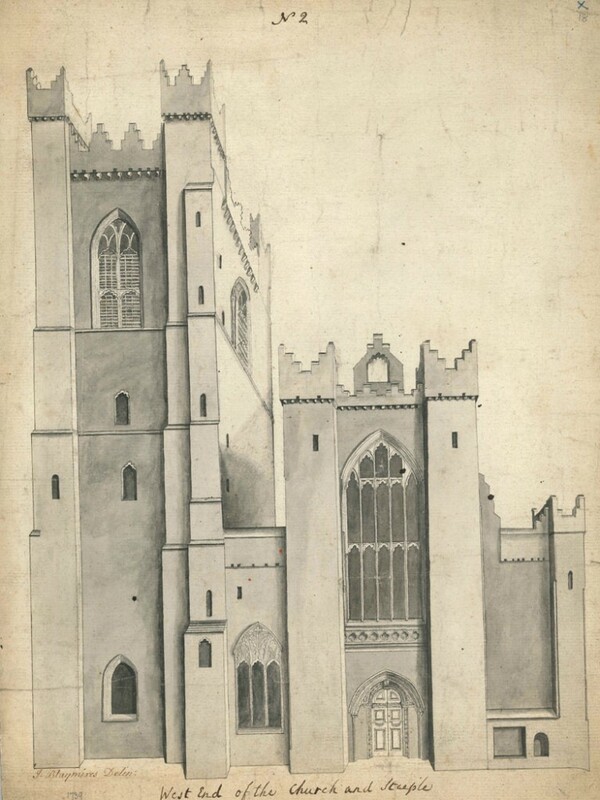 Drawing on the collections of the Cathedral itself, of St Patrick’s Deanery, the Representative Church Body Library and the Irish Architectural Archive, the exhibition looks in particular at the major efforts to restore the Cathedral in the nineteenth century. John Bowden, 1820. 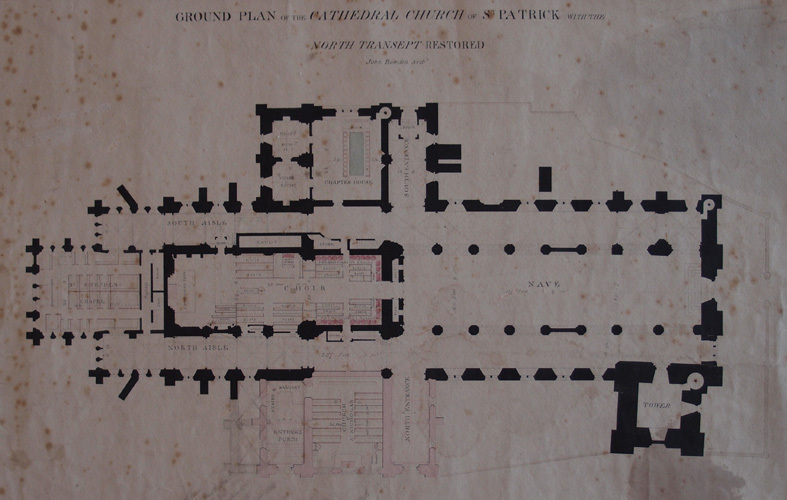 Plan of St Patrick’s Cathedral. Collection: Representative Church Body Library. A guide book to Dublin noted in 1820 that ‘the venerable St Patrick’s [is] an interesting pile, although the site, it must be confessed, is particularly injudicious… and the heavy dead wall and disgusting huts which surround it are certainly no ornamental appendages’ (Thomas Cromwell, Excursions Through Ireland, London, 1820 p.97). Nonetheless, the guide went on, the building surely deserved a better fate than ‘to totter into irretrievable ruin, which from present appearances seems to be its no very distant doom’. And indeed, the fabric of the Cathedral was, by the first decades of the nineteenth century, in poor shape. The north transept was in ruins, walled off from the nave and exposed to the elements; the south transept and the present Lady Chapel were also walled off, one for use as the chapter house and the other as a place of worship for Huguenots. The walls of the nave were bulging and inclined while the roof was propped with timbers. Only the tower, with its steeple of 1749, seemed ‘likely to remain entire for any long period to come’. R C Carpenter, 1845. Proposed restoration of West Front. Collection: Representative Church Body Library. William Farrell carried out some structural works in the 1820s and two decades later the architect Richard Cromwell Carpenter made designs for an extensive restoration of the Cathedral. These were exhibited at the Royal Hibernian Academy in 1846. 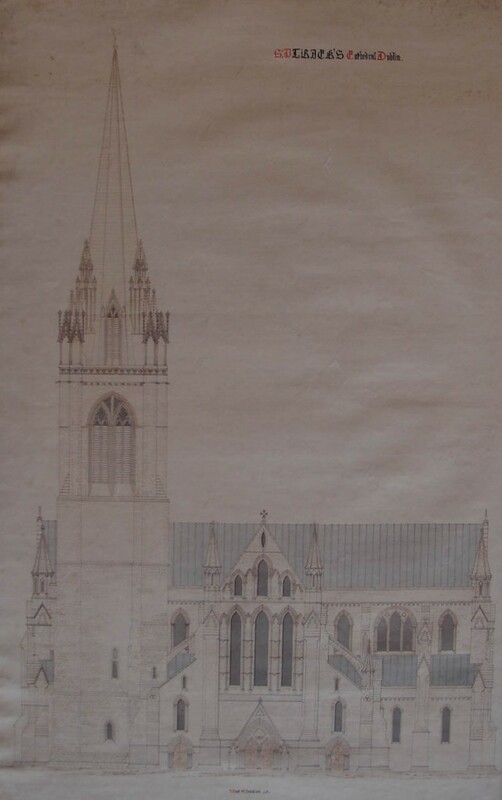 Although some work was carried out on the Cathedral during the next few years, Carpenter died before Benjamin Lee Guinness’s gift of £20,000 to the Dean and Chapter in 1860 made possible a new and lavish phase of restoration. 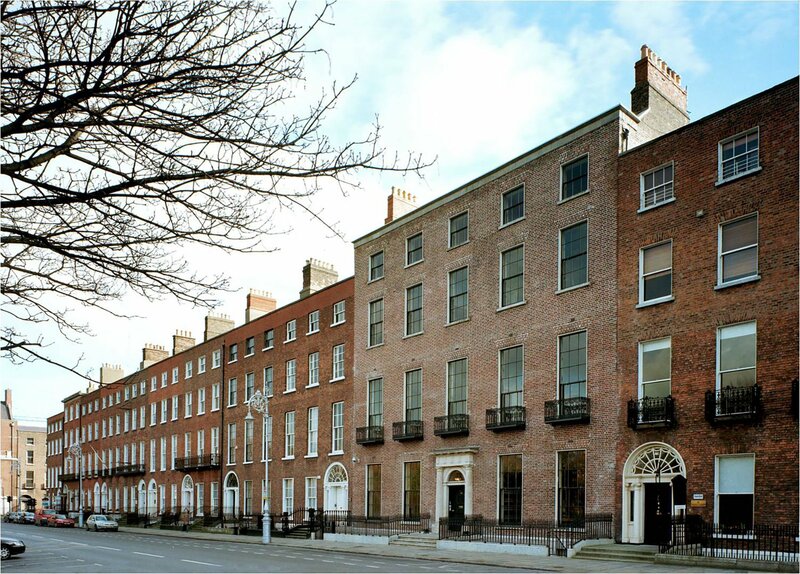 Effectively abandoning Carpenter’s designs, Guinness insisted his views take precedence and ensured that Timothy Murphy & Son, builders, were contracted to carry out the work. The restoration was supervised, not by another architect, but by Patrick J. Murphy, the builder’s son, a fact which resulted in much contemporary criticism. Further works were carried out in 1901 under the direction of Sir Thomas Drew but the Cathedral as it stands today is substantially as Guinness and Murphy left it and this exhibition marks the 150th anniversary of the completion of these works in 1865. C.A. Bowles, c. 1935. 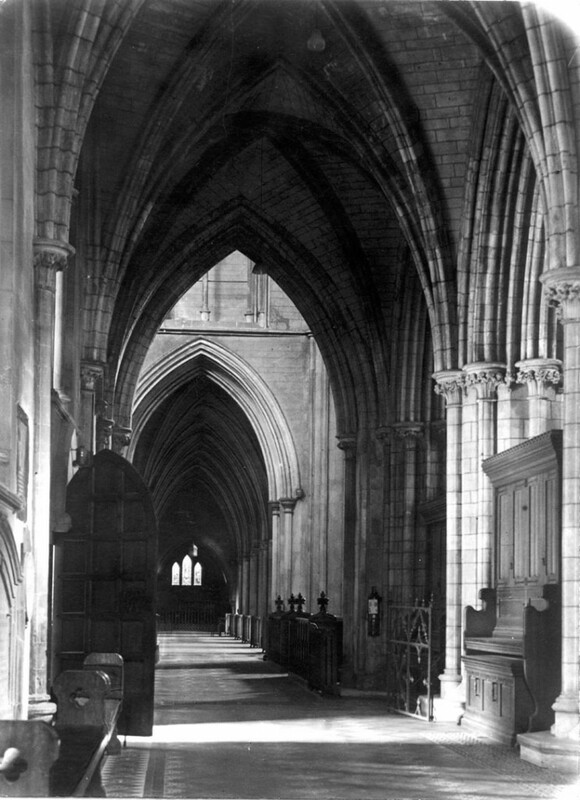 Interior view of St Patrick’s Cathedral. 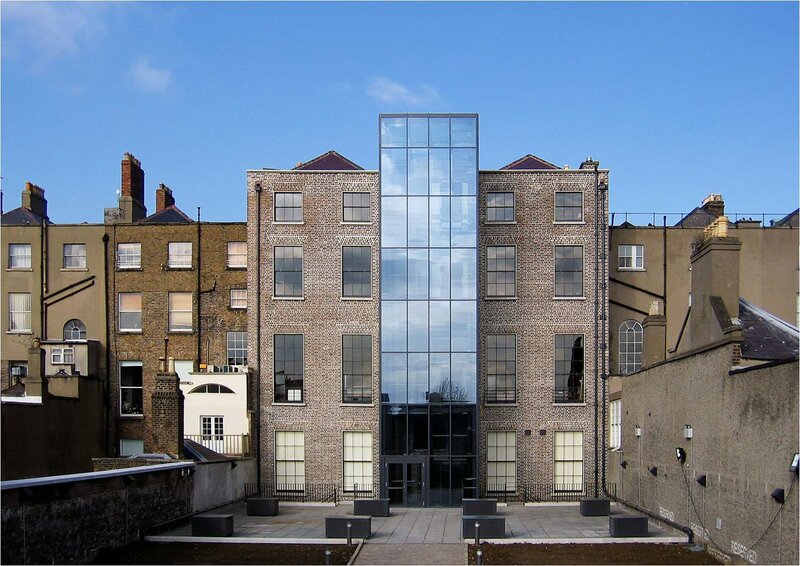 Collection: Irish Architectural Archive. The Irish Architectural Archive would like to thank the following for their help with this exhibition: Liz D’Arcy, Ecclesiastical Insurance, the Hon. Rory Guinness, Scott Hayes, Jennifer Hickey, David Lane, Dr Michael O’Neill, the RCB, Dr Raymond Refaussé, Dean Victor Stacey, and Gavan Woods.